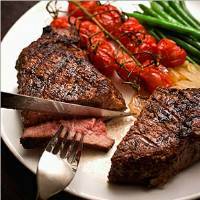 Burgundy steak marinade brings out the tantalizing, full rich flavor of steaks. Combine marinade ingredients and mix well; Place mix in container and add steaks; turn to coat, Cover and seal. To make steaks tender marinate for no more than 2 hours. Steaks can be marinaded for more than 3 hours if desired, however, steaks may become mushy and may lose their natural flavoring. Heat grill. When ready to barbecue, drain steaks, reserving marinade. Place steaks on grill over medium heat 4 to 6 inches from medium coals. Cook to desired doneness, turning once and basting frequently with reserved marinade. Discard any remaining marinade. BROILER DIRECTIONS: Prepare recipe as directed. Place steaks on broiler pan; broil 4 to 6 inches from heat until of desired doneness, turning once and basting frequently with reserved marinade. Discard any remaining marinade.